Corporate Social Responsibility (CSR) has been deeply rooted in the Company’s business culture since inception. The Company is committed to conduct its business operations in an environmental friendly and socially responsible manner. Through its various CSR initiatives, it has been the Company’s constant endeavour to impact the lives of underprivileged people of the society and the environmental sustainability. Shree Vasant Narayan Desai Multipurpose Charitable Trust, set up in memory of the Wagh Bakri Tea Group’s founder Shri Narandas Desai and Vasantba, also generously donates to the downtrodden people in the society for various causes since past four decades. In 2001, when a devastating earthquake shook the State of Gujarat, the group worked non-stop to help the affected people here. It has also donated generously for polio eradication to the Sevani Suvas Polio Foundation. The Group ascribe much importance to Education and felicitates outstanding students every year from across the Gujarat. The Company’s CSR role has emerged from time to time in different forms while working for the social cause. The Company’s CSR projects are aligned to benefit the needy and underprivileged people of the Society so also to contribute to Environmental, Social and Economic sustainability. The Company has undertaken its social activities and projects in the fields of Women Empowerment, Education, Health Care and Environmental sustainability with the help of eminent implementing agencies, which excel in their own fields of social work. Cancer Awareness, Research, Aid to Cancer Patients etc. The Board of Directors (the “Board”) of Gujarat Tea Processors & Packers Ltd., (the “Company”) has adopted the following policy and procedures with regard to Corporate Social Responsibility. The Board may review and amend this policy from time to time subject to the recommendations of Corporate Social Responsibility Committee. The Company’s Corporate Social Responsibility (CSR) policy is framed in accordance with the notification issued by the Ministry of Corporate Affairs dated 27th February 2014 under Section 135 of the Companies Act 2013 (“the Act”). To actively initiate projects and/ or participate in projects to improve the life of people. Company will strive to provide vocational training to improve skills of people in the primarily unorganised sector. Women, Children and other disadvantaged person’s Welfare. To provide encouragement and support to various selfless workers and institutions helping them. Company shall manage its operations using principles of Sustainable development to minimize impact on environment and protect health & safety of all stakeholders. CSR committee of the Company comprises of four members; of which one is an Independent Director. The present composition of the CSR committee consists of the following members of the Board. Shri Piyushkumar O. Desai is the Chairman of the CSR Committee. All the members of CSR committee have rich and varied experience and are directly or indirectly involved in CSR activities at different levels. CSR committee formed by the Company shall work in co-ordination and in accordance with directions given by the Board from time to time. Recommend, formulate and implement CSR activities approved by the Board and in compliance with Schedule VII of the Act. Specify projects and programmes that are to be undertaken, list out the programmes which Company plans to undertake during any financial year and specify the modalities of execution of CSR activities. Monitor and recommend the amount of CSR Expenditure to be incurred for CSR activities and to ensure it is in line with the CSR Policy. To monitor CSR Policy of Company from time to time. Any other activity as may be advised by the Board or as may be required by governing law or statute. The Company proposes to implement CSR Programs through Company personnel, contribution to any trust/fund/association focusing on CSR activities or through external implementing agencies. The Company will specify the CSR Programs which may be undertaken by those agencies in accordance with CSR policy of the Company and governing laws from time to time. The monitoring and review mechanism shall be followed for the CSR initiatives, which shall ensure a top down review and delivery. Regular review of amount spent on each activity and achievements against milestones and objectives by the CSR Committee to ensure a transparent monitoring process. The management shall in consultation and through the supervision of the CSR Committee consider projects with detailed programmes to be undertaken, proposed amount, timeline and a conformation that such projects are eligible under the Companies Act, 2013 and the rules made thereunder from time to time. The CSR Committee shall be responsible for overseeing the planning, coordination and implementation of CSR activities and compliance of the same shall be reported to board and the same shall be reported to stakeholders through the Company’s Annual Report. CSR expenditure will include all expenditure as may be permitted under the applicable laws, including contribution to corpus for CSR Programs approved by the Board on the recommendation of its CSR Committee, but does not include any expenditure on an item not in conformity or not in line with activities as permitted under Schedule VII of the Act. The Board’s Report of the Company shall include an annual report on CSR containing particulars specified in the annexure to the Companies (Corporate Social Responsibility Policy) Rules, 2014 pertaining to a financial year commencing from April 1, 2014. The contents of the approved CSR Policy and any amendment thereto shall be disclosed in the Board’s Report and displayed on the Company’s website. The Company is committed to continuously reviewing and updating policies and procedures related to CSR so that they are in conformity as legislative changes & amendments in Companies Act, 2013 from time to time. 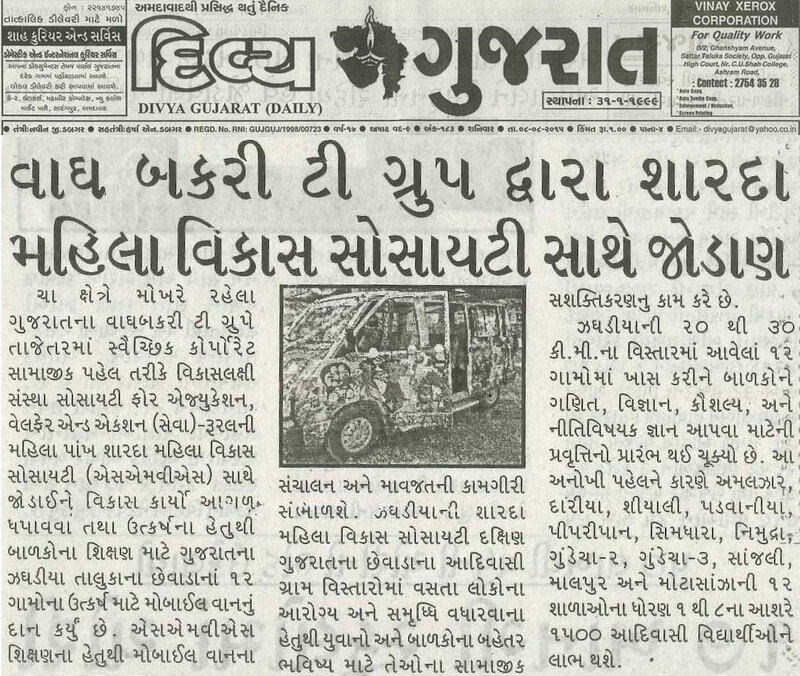 Wagh Bakri Tea Group inaugurated Mobile school in the interiors of Jhagadia Taluka. The Wagh Bakri-AMA (Ahmedabad Management Association) Centre for Governance set up in 1998 focuses on disseminating unbiased opinion on issues relating to public policy and community welfare. Study of corporate values and ethics is also a part of the Centre's activity. Education is given its due importance. Profile: Dr. V. Raghunathan is an academic, author, columnist, hobbyist and a CEO. He is currently, Director, Schulich School of Business, India. Profile: Mr. Praveen is a Fellow of both the Chartered Insurance Institute and the Insurance Institute of India and has a diploma in Direct Marketing (IDM, UK). He is currently MD & CEO Raheja QBE General Insurance Company Ltd. Profile: Pujya Swami Tejomayanandaji Head, Chinmaya Mission Worldwide On this occasion Swamiji has kindly consented to release the book “Work Ethics in Gita”. Profile: Dr. M. B. Athreya is a Delhi based management advisor. He was formerly prof. at Indian Institute of Management - Calcutta, and at the London and Scottish Business Schools. Profile: A graduate International Trade School, Hamburg (Germany), Mr. Lars Ellebrock is the 3rd Generation entrepreneur of Halssen & Lyon Tea Group, having a vast experience in International Business. Profile: Suresh Prabhakar Prabhu is an Indian politician and the current Railway Minister of India. He is a Chartered Accountant by profession and a member of the Institute of Chartered Accountants of India. Since 1996, Prabhu has been a repeatedly elected Member of Parliament from Rajapur Lok Sabha constituency in Maharashtra. Profile: Renowned Economist, Former Union Finance Minister and from 1971 to 1990 he was an M.P., elected to the Lok Sabha for 5 times consecutively from Rajapur in Konkan, Maharashtra. He was one of the prominent opposition leaders when Indira Gandhi and Rajiv Gandhi were the Prime Ministers. Profile: Arun Jaitley is currently the Minister of Finance, Minister of Corporate Affairs and Minister of Information and Broadcasting of India. He is a member of the Bharatiya Janata Party (BJP). He has also previously held the portfolios as the Minister for Commerce and Industry, Law and Justice in the National Democratic Alliance government.